Charges: Adult £2.00, Junior £1.00. There is an additional 30p charge for use under floodlights. 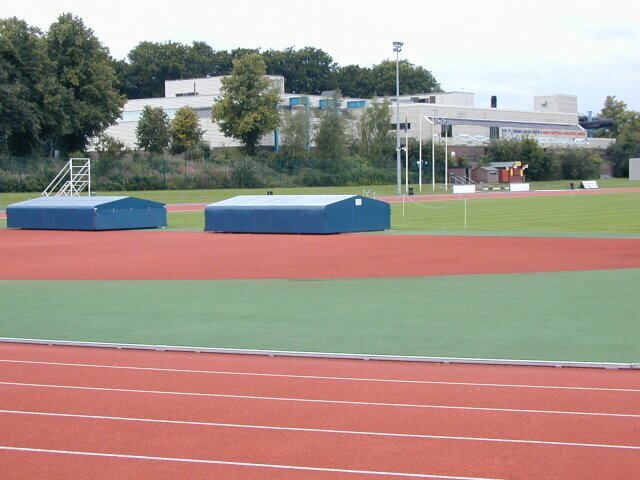 The track was built on a grass field immediately next to the Bury St. Edmunds Leisure Centre and was officially opened on 14th Sep 1997 by Roger Black. It replaced a cinder track which was on the field behind the back straight which was grassed over when this one was built. The track is on the grounds of the King Edward VI School who regularly use it but it is managed from the Leisure Centre. The English Schools Champs were held here in 1999. The track is of the non porous synthetic type but the green areas in both Ds are porous. There is a curbside pacing system called Pacemetre which uses flashing lights and which was officially launched on 21st October 1998. It is currently the only such system in the world. The product was designed by and is marketed by Omer Products.